The Scorpio man is by nature very strong and perceptive who attracts other people easily. You have the capability to look into the future and have strong feelings which makes it difficult for others to understand your personality easily. In your dealings with other people you make difficult demands from them, which fortunately are accepted by them. Whenever others come in contact with Scorpio men, they will leave an everlasting impression. The Scorpio father personality traits show he has a sound reasoning faculty which is balanced by his sentiments. You are an expert in deciphering what is going on in the minds of other people and treating your kids with compassion. All your thinking and deeds are driven by a powerful intention. Whatever you lay your hands on, you will put your best effort to complete it. Your associations with people will be thriving, strong and permanent, or they fail to take off. The Scorpio father traits show he is highly compatible with a Pisces daughter in general. Both are bound together by their traits of sensitivity, creativity and instinct. Pisces daughter feels secure and important by the way her father brings her up. She attracts her Scorpio father by her qualities of strong brain power, imagination and bravery. The Scorpio father personality traits show that when you learn that you are going to be a father, you are emotionally ready to receive your offspring. The Scorpio father characteristics show you look for a huge potential in your child for the future. Your child on arrival to this world is nurtured to the best of your capacity. You start inculcating the qualities of vigor, liberty and order in your child gradually. The child of a Scorpio parent will become conscious of your expectations from him in due course. The child will grow into a disciplined and obedient character that rarely disobeys his Scorpio dad. You are adored by your child for your leadership, motivational quality, bravery and accountability for your actions. The Scorpio male has the natural capacity to draw women towards him and is a highly loving person. However you are incapable of expressing your thoughts freely to the person you love. You tend to lose your temper quickly. The Scorpio father traits show you are highly possessive about your loved ones especially your children. 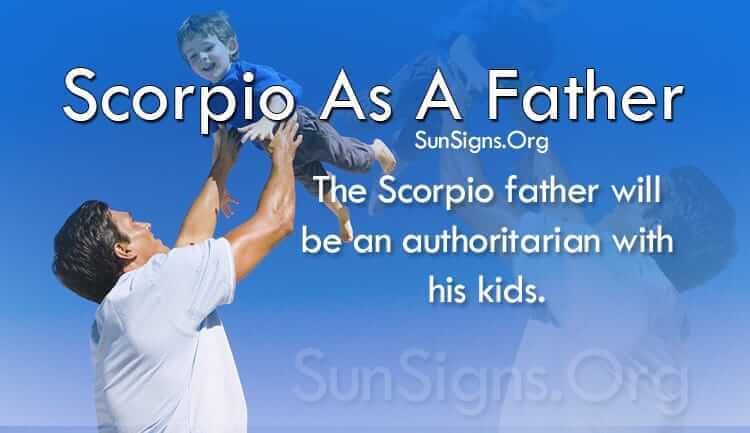 The Scorpio father characteristics show you will be an authoritarian when dealing with your child. Too much anxiety about your child will limit the independence of the child. The child will find it hard to comprehend the true intentions of his father because of his strict behavior. Your strict behavior is done with the good intention of improving his life in days to come.You can see what is going on in your child’s mind even if they are secretive about their intentions. The Scorpio father personality will detest if other people start counseling about the right way to bring up your child. It is necessary for you to be free with your child and articulate your feelings to your child. Scorpio father has a mysterious personality which he hides from others and the kid will take time to understand this character.